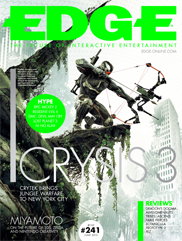 My latest article on the psychology of video games for Edge Magazine has been published in issue #241. It’s the one with the Crysis 3 cover. In it, I explore a bit about some theories of decision making and genre usage that may clue us in on why we like the genres we like. Why do we have genres, and are the ways that we think about game classifications doing us a disservice? What factors make us more or less likely to depend on these mental shortcuts and compensatory strategies? It varies with expertise. Novices tend to substitute knowledge of a genre for knowledge about the specifics of a game. This is a widely studied phenomenon within the field of consumer psychology, especially in the context of brands. It’s been found to be especially true the less expertise we have with a product. In one study, C. Wahn Park and Parker Lessig found that people with limited experience buying microwave ovens tended to get overwhelmed with all the different options. Too many popcorn buttons and auto defrost settings were apparently too much for the novice buyer at the time to handle. What people who were unfamiliar with the product tended to do was collapse all the differences between options and consider them equivalent. So a microwave with seven power settings was lumped in with those only having five, because buyers were unable to put their fingers on why seven was that much better than five and how to weigh those factors when making a decision. Instead, the subjects tended to look at things like brand and other aspects that the researchers termed “non functional dimensions” in order to make their price. Good experiences with a particular brand in another context was substituted for (or at least overshadowed) all the confusing technical differences, because that was easier and required less mental effort. …It’s not difficult to see how this applies to video games and genres –or brands and series for that matter. Those who are less familiar with the huge variety of video games won’t understand all the technical aspects of the games. Asynchronous multiplayer? DirectX 11 support? Dedicated servers? Hours of gameplay? For inexperienced buyers who don’t make it a habit of reading magazines like the one you have in your hands right now, all those detailed, technical aspects of the game are going to get squished down to a few broad but shallow categories to make the mental strain of the decision easier. The magazine is on store shelves now, if you’d like to pick it up. Up next month: The Psychology of Nostalgia explains (in part) why we have so many reboots, sequels, and retro games.